Today was an absolutely gorgeous day, a much-needed reprieve from the dreary, cold, overcast weather we’ve endured for several months. With temperatures rising into the low 80’s, I couldn’t wait to spend some time after work at one of my favorite parks. 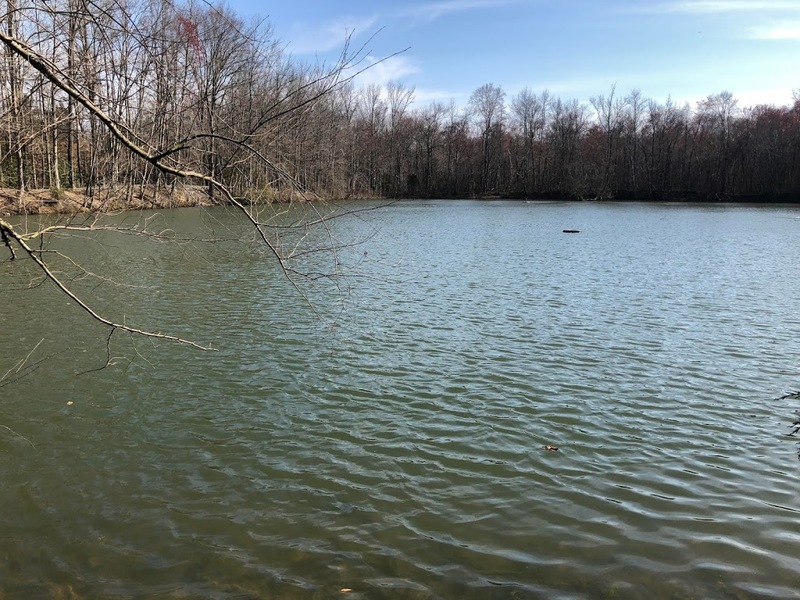 I sat on the weathered, wooden bench that overlooks the lake and pulled out a book to read, feeling the breeze dance across my face as the rays of the sun sparkled across the water nearby. With each word I read, I was pulled away from the stress and strife of life and lifted up with hope and positivity. As I finished one chapter and started the next, I heard the jingle of a dog collar and looked up. To my right there was a family of three, leaning over the wooden rail, watching the fish and turtles swim in the lake. To my left was a lady with her black dog trying to take a selfie with the lake behind her. I watched her for a moment, my gaze hidden behind my sunglasses. 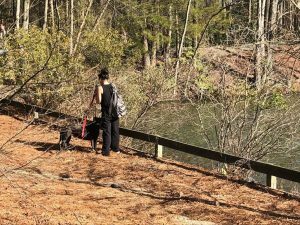 She was kneeling beside her pet, her phone in her left hand; her right hand holding the dog leash close. 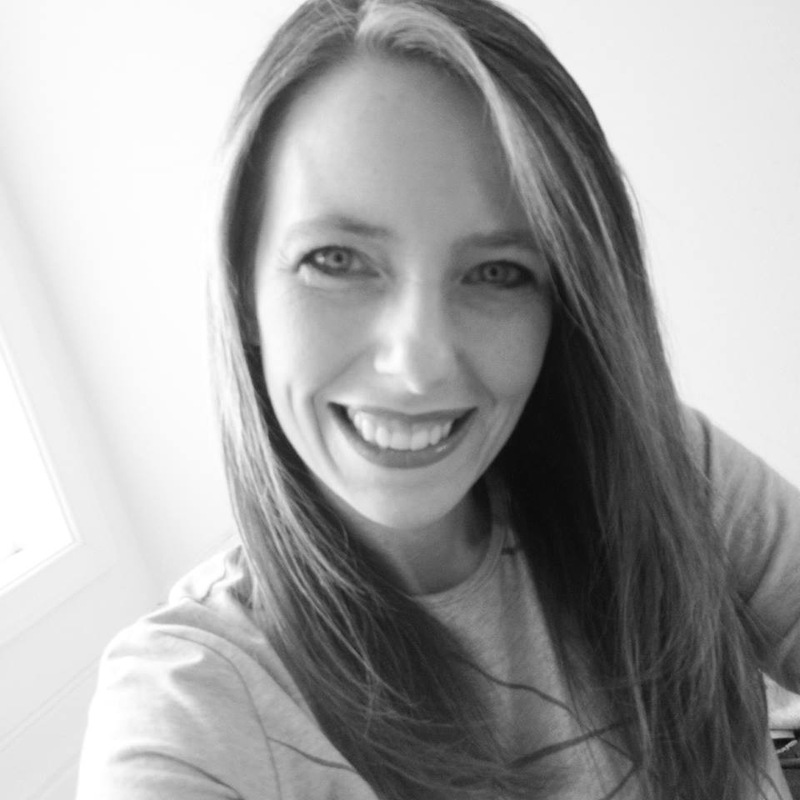 She smiled towards her outstretched arm, then tried to get her dog to look at the camera, too. The dog sat obediently, but looked this way and that, mesmerized by the sights and smells of the park. Without hesitation, I closed my book and left my bench, a smile on my face as I approached the girl and her dog. “Want me to take your picture?” She looked up and returned my smile with a genuine “Thank you!” as she handed me her phone. She kneeled again and I got into position, my role shifting from observer to photographer. 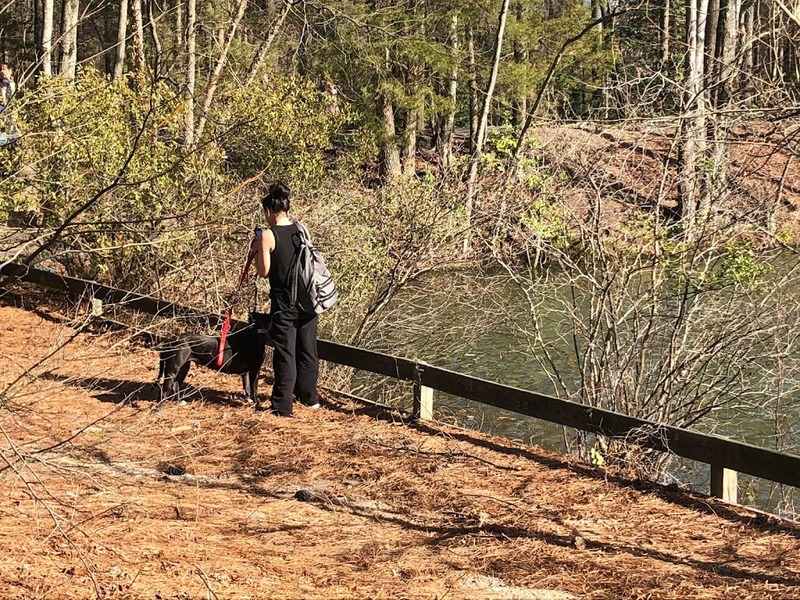 I took several photos of her and her dog with the lake shimmering in the background. “I hope one of these works out,” I replied as I handed her phone back. As I returned to my bench, she shouted, “You really made my day! 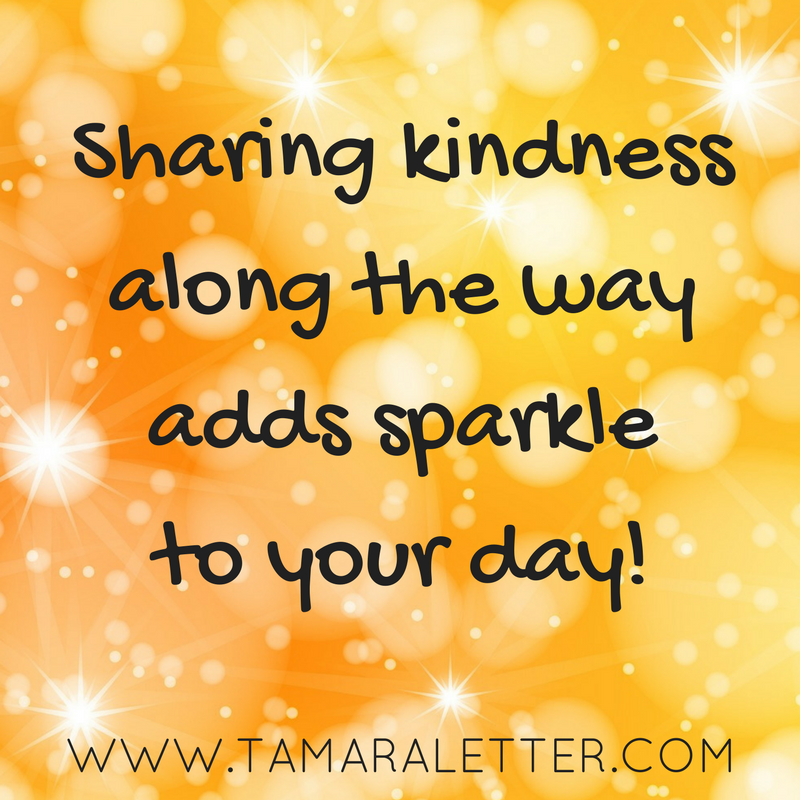 I am so happy you did that for me!” The gratitude in her tone was so pure and authentic, it made me shine a little brighter than I had before. 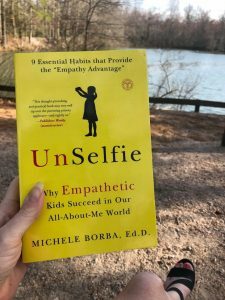 As I sat back on the bench and picked up my book, I started to laugh at the title that stared back at me. Perhaps it will give you a giggle as well! Today’s random act of kindness may not seem like much to some, but I know it meant a lot to this gal and her dog. Sometimes the best way to take a selfie is to have someone do it for you. What ways have you stepped out of your comfort zone to help a stranger in need? Comment below and share your stories so we can inspire the world! Several people have reached out to me on Twitter and Facebook inquiring about our Innovation Lab and its transformation. I realized, while I have spotlighted several activities throughout the year, I have yet to write an overview of our journey thus far. I became a technology integrator ten years ago, assigned to an elementary school in the same district I attended as a child. I have been in the same room, in the same school, for all of this time. Over the years, it has been a huge struggle for me to get others to view this space as “our room” as my desk was in the back and the room was filled with heavy tables, chairs, and laptops. Because this was the room I was assigned, people viewed it as “Mrs. Letter’s Lab”, not a shared working space. 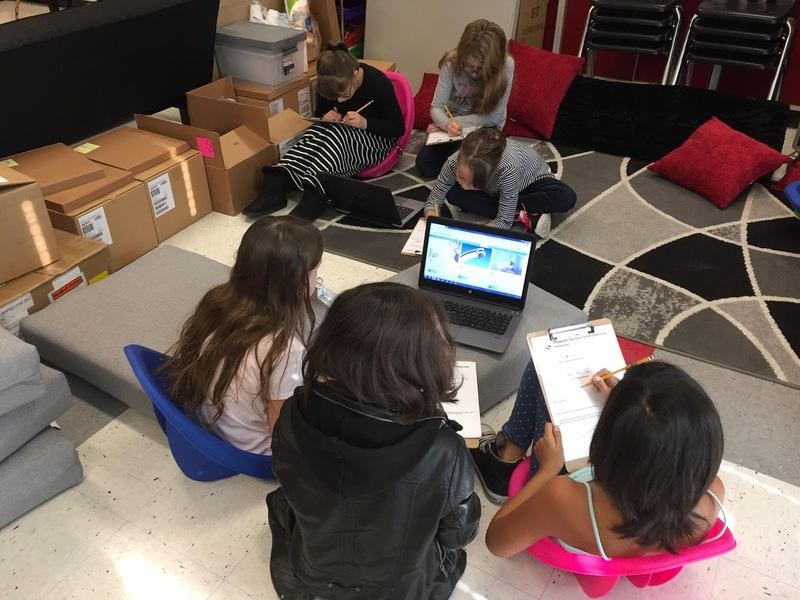 When teachers wanted to collaborate with me, they brought their students to this space because it was easier than rolling a huge, metal cart across our open-campus school with sidewalk cracks and uneven terrain. 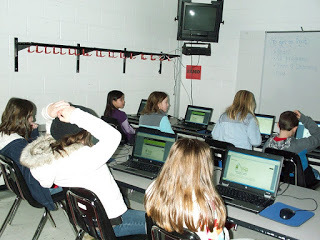 Every lesson used a laptop. Every student sat in a chair. Every chair faced the front of the room. I died a slow death with each lesson I taught. Ten years ago, “innovation” wasn’t the focus as it is now. I struggled to adjust to this new structure of instruction – wanting to support technology integration efforts of others in a space that never shifted, with a room design that was static and stagnant. When I was a classroom teacher, my room was fluid. If I wanted small group work, we moved desks around and made it happen. When we had a camping day as a culmination for our “Where the Red Fern Grows” unit, we pushed the desks to the side, brought in pillows, sleeping bags, and flashlights, and told spooky stories while “roasting” Smores over our pretend campfire. I was that teacher. 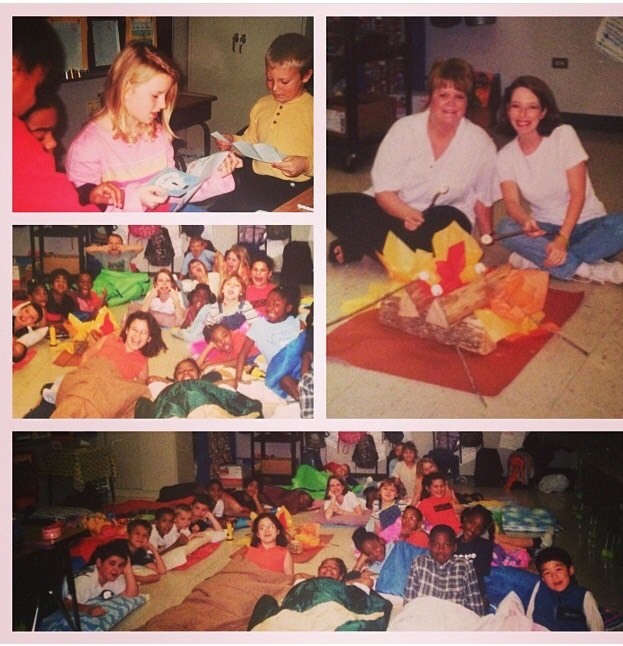 I did whatever it took to engage my students in learning and make my classroom the space that I wanted as a student. I would dress up as a pioneer. I would transform my students into museum tour guides. I created learning experiences that went beyond the textbook because I wanted to cultivate a love of learning in my students in the same way my 6th grade language arts teacher, Mrs. Dalton, did for me. She had a plastic bubble. In the middle of her room. You could read, write, or draw in the bubble, but had to earn the right to go inside. That’s all the incentive I needed to become a teacher. But that was then and this is now. I changed roles from classroom teacher to technology integrator and this was my new reality. Four walls and a door. Twelve tables, twenty-four chairs. I taught my lessons, walking in and out of each row, monitoring laptop screens from the back, but I knew this wasn’t ideal for learning. It wasn’t ideal for my students. It wasn’t ideal for me. 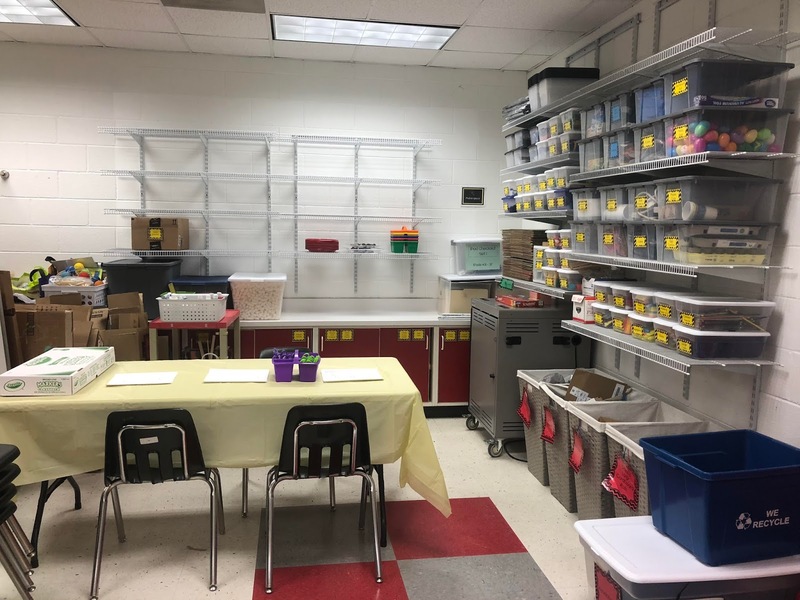 Since a large part of my job is providing teachers with professional development, I wanted a space that could attend to their needs as well, in a cozy environment – not one with stark, white, cement walls and immobile furniture. I needed more. They needed more. Two years ago I took a risk. I started a GoFundMe campaign to change up the back corner of Lab 1 so it was more appealing for teachers. Inspired by the #StarbucksMyRoom hashtag, I designed this space, dreaming big. Gone was my teacher desk – I wanted bar height tables and chairs! A coffee maker! A bookshelf with new, relevant books by up-and-coming authors (not the books that were written decades before and collecting dust in my garage.) Could I even get a sofa? Who puts a sofa in a computer lab? The start of our Lending Library – always accepting donations! Doesn’t everyone have a sofa in their computer lab? With the financial support of friends, family, and community stakeholders, we opened our Tiny Tech Cafe September 6, 2016 and the response was overwhelmingly positive. Teachers were now stopping in to grab a cup of coffee or take a quick break in their day and almost always these resulted in conversations with one another. My relationships with teachers grew as did my desire to make this happen for students, too. 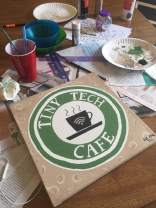 I even painted our own Tiny Tech Cafe canvas! Our grant was fully funded (with matching funds from my school) and we were on our way! So exciting! Unfortunately it was a painstakingly slow process to get everything in place according to the vision and timeline. When school began in September, I was still waiting for bulletin boards to be removed, shelves to be added, and stools to be put together. There was no official “Welcome to Our Innovation Lab” grand opening because… well… it was, and is, a constant work in progress! But we had portable tables and, for me, that was enough to start diving in! As the year progressed, we started building out the room. We purchased a green screen app for our iPads and made arrangements to keep the iPads in the Innovation Lab so access was equitable and convenient. We even created a coloring poster and invited students, teachers, and parents to work together to make it come to life so a part of them would be displayed in our room. 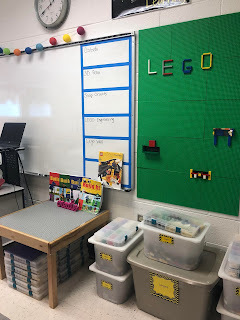 We put velcro tabs on the wall and added 12 x 12 Lego plates so the traditional “Lego Wall” could actually be dismantled into individual work stations using the Legos we inherited from a former Legos club. Each green tile can be removed from the wall to use anywhere in the room. Students can zip themselves inside the recording station to record! “If you build it, they will come.” I clung to this Field of Dreams mindset, hoping others might see the potential this space could have for ALL students, ALL teachers, ALL disciplines. 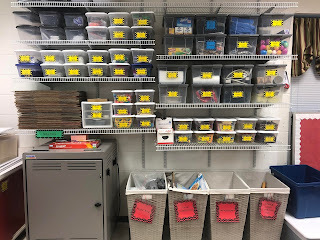 I started shifting the types of lessons I offered with teachers, guiding them through problem-solving design processes and small group station rotations with students leading the way. 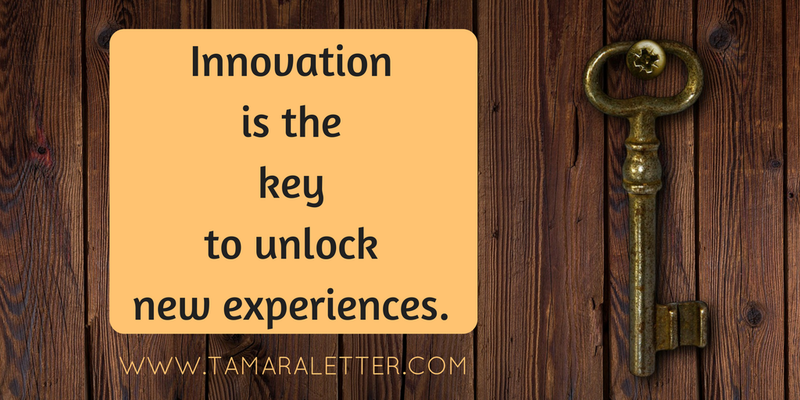 The Innovation Lab wasn’t just a shift of space; it was a mind shift as well. In February, our bulletin boards were removed from the walls and shelves added in their place which completed our makerspace area. Now we could store our bags and crates of supplies into neatly labeled containers that were easy to reach. Makerspace ready for use with shelves for project creations! Our Innovation Lab has 100% flexibility in design, in purpose, even in scheduling. We created a website for our space and distributed magnets with the website URL to all teachers so at the click of a mouse they can add their name to a Google Sheets spreadsheet and reserve the lab for whatever need they have. They can also use this website to request supplies, borrow a book from our lending library, or be inspired by lesson ideas of others. I’m proud to see all the ways this space is being used. We’ve had theme days like Talk Like a Pirate Day with back-to-back lessons complete with station rotations. We’ve shared in collaborative learning experiences between classes as older students support the learning of younger students. We’ve coded robots, designed three dimensional shapes with 3D Doodler pens, and created public service announcement commercials about why you should Save the Bay. Our students are at the helm of their learning experiences. They are teaching us how to create videos with iMovie and new uses for cardboard rolls and tape. They are solving real world problems and developing compassion and empathy in the process. They are offering suggestions on how to make things flow better and sharing their expertise with others. They are even taking ownership of JOY with Jubilant Outcries of Yes! And the moment that testing is complete, we can get back to learning the way learning is intended. The way we need it to be. Connect with Tamara on Twitter (@tamaraletter) or email (tletter@hcps.us). We also welcome visitors, so please contact her to set up a date/time if interested in stopping by! A special thanks to Dave Burgess, George Couros, Katie Martin, Tom Murray and Kayla Delzer for their innovative ideas and inspiration that fueled the fire for change. We are definitely better together! 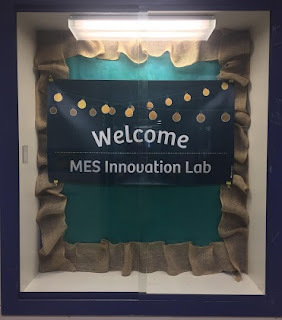 For more information our journey in creating this Innovation Lab, visit the blog posts below! We have no idea how far our seeds can scatter. Two weeks ago we celebrated Random Acts of Kindness week (#RAKweek2018), a global celebration of kindness promoted by the Random Acts of Kindness Foundation. 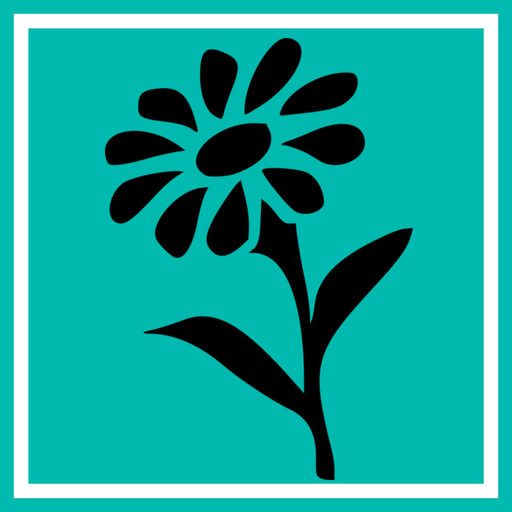 As part of our year-long “Passion for Kindness” initiative, we decided that Valentine’s Day would be a perfect day to dive into a new project – scattering seeds of kindness throughout our school to remind people that they matter. 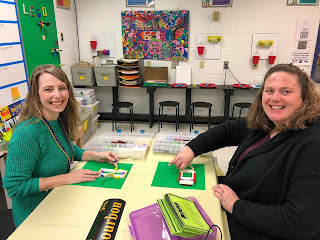 Our planning caught the eye of our local news station, WTVR Channel 6 news, and Rob Cardwell visited our lesson to showcase it on their Building Better Minds segment. It was an exciting day for us as we have continually expressed to our students the importance of sharing their story with the world and using digital communication for good. Now we had an opportunity to make it happen for REAL! We began our lesson by revisiting the progress on Jet Stream Jax’s Peaceful Hearts Playground, as our students had donated coins in the fall for the Kind Coins campaign to rebuild school playgrounds following the aftermath of Hurricane Harvey. We zoomed in to the photos Barbara Gruener provided of their kindness rocks and peeked at her Flipgrid to see an example of the messages they painted on their rocks. We also talked a bit about how kindness rocks have been used in our local community with #rvarocks on Twitter and RVA Rocks Facebook Group. 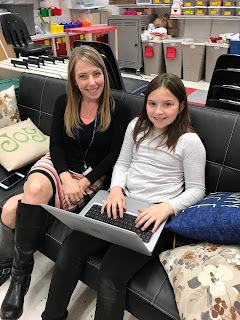 The students spent the next forty minutes creating and collaborating; it was a delight to show our visitors how seamlessly we incorporate our state-mandated content of reading and writing with character development, social emotional learning (SEL) skills, and the 5C’s of successful life skills. Our rocks were set aside to dry and we made plans to hang our posters and share our hearts of gratitude later in the week. That afternoon the world learned about the tragedy at Marjory Stoneman Douglas High School in Parkland, Florida. Now there are 17 more. I. Can’t. Believe. This. Is. Happening. 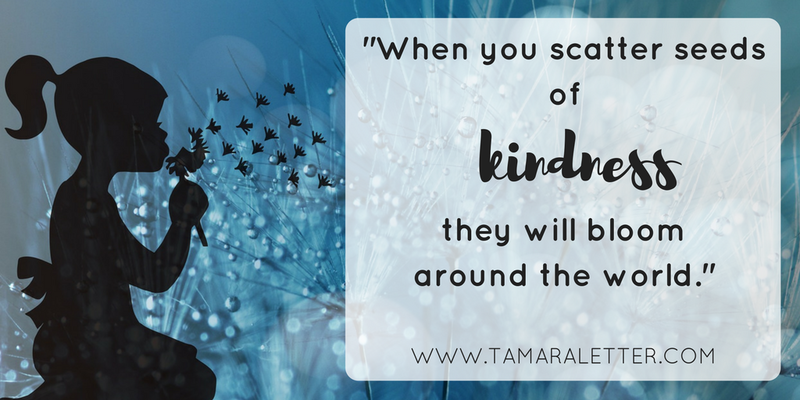 As an educator, my sweet little world of kindness came to a crashing halt. 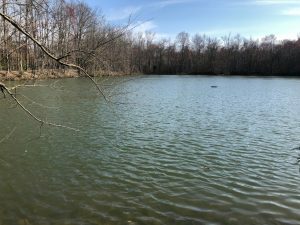 I wrote a bit about my feelings in my I Can post as the tragedy swirled in my brain. The next day it was business as usual in my elementary school, but I felt the weight of the horror pressed against me, a dark cloud suffocating the joy from the day before. I wanted to do something, anything, to share kindness with this school community who would be forever changed by the events on Valentine’s Day. But what on earth could we do to possibly help them? I brought the idea to Mrs. Madison and her students to see if they would be interested in donating their beautifully painted kindness rocks to another school that might need a little reminder of hope and love and joy. They readily agreed. We did not talk about the tragedy at hand; but rather, we talked about the impact kindness has when it is scattered and shared with others. We imagined what it would be like for others to find our rocks and how they could keep the rock as a reminder of kindness or hide it again for someone else to find. Hope and love and joy. “Say their names” was a constant whisper on my heart. I decided to make seventeen of our rocks memorial rocks, one for each of the lives lost on that day. As I added their names to my bullet journal, I lifted up a prayer for each of the families whose pain was greater than I could bear. On the back of each kindness rock, I added their names then wrote encouraging messages on the remaining rocks. I captured each rock using Flipgrid so anyone who finds a rock with #kind4MSD on the back could leave a video response in return. My assistant principal, Mr. Davis, posted the Flipgrid on our school’s Facebook page, which caught the attention of my district. 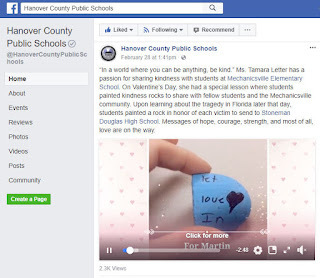 They, in turn, created a video compilation of the memorial rocks to post on our district social media sites. The next morning, our rocks were mentioned on the news. By a different news station than the one who had filmed our lesson the week before. The seeds of kindness are scattering. In times of complete and utter helplessness, we often feel paralyzed, like there is nothing we can to do make a difference, no action we can provide that will make things better. I felt that immobilization for a solid week before I realized that all the tools I needed to show compassion were with me the entire time. A heart to comfort the pain of another. 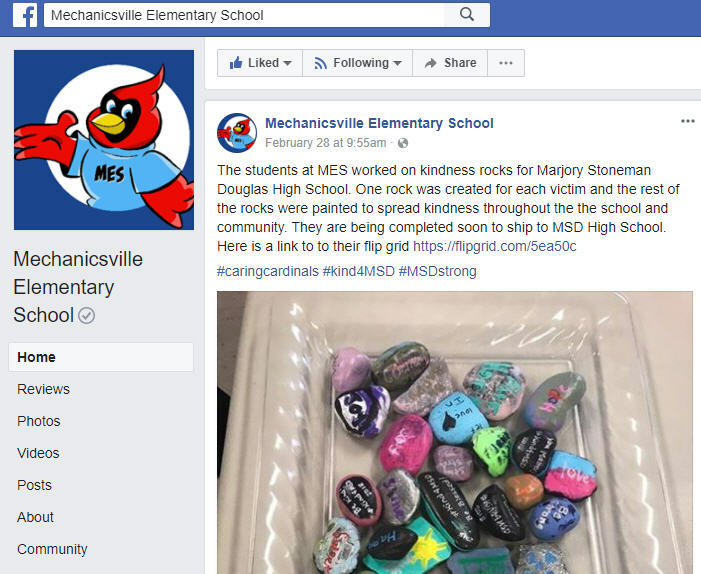 We are sending out our kindness rocks to Marjory Stoneman Douglas High School this week in hopes that when they arrive, someone at the school will hide them around campus to be discovered by students and staff. We will check our #kind4MSD hashtag periodically to see if there are any updates or posts from others or perhaps it will spark more kindness rocks to be created and shared around the world! 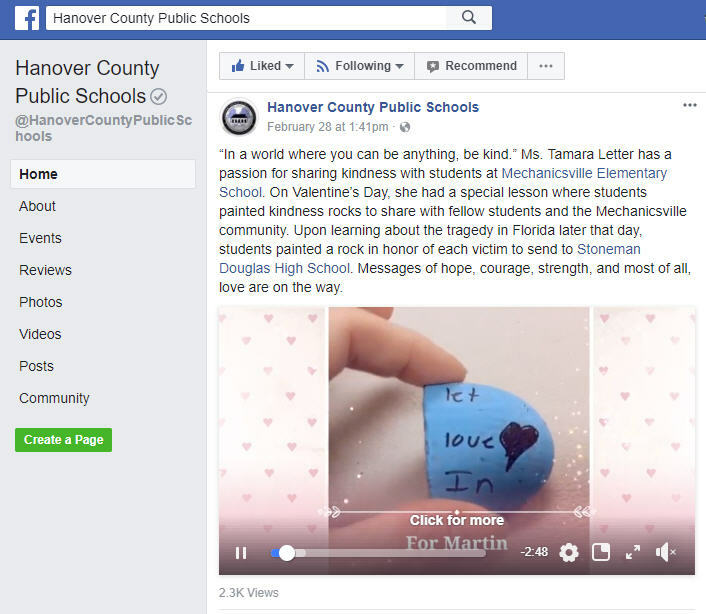 On Tuesday, March 6, WRIC Channel 8 News in Richmond, Virginia, showcased our kindness rocks during their 6pm broadcast. On Wednesday, March 14, WTVR Channel 6 News showcased our kindness rocks during their Building Better Minds segment at 6am and 6pm. 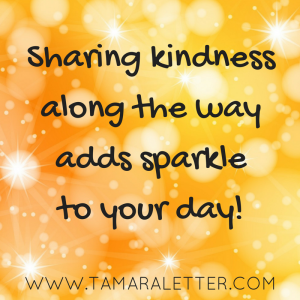 Follow Tamara on Twitter or connect with her Passion for Kindness Facebook group to join in the fun of sharing kindness. 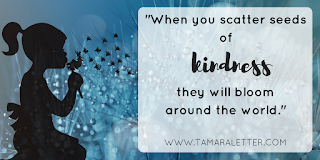 Tamara’s book, A Passion for Kindness: Making the World a Better Place to Lead, Love, and Learn will be published in February 2019. 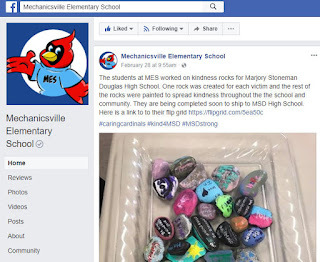 For more information on kindness rocks read this post by Rachel Moravec, visit #rvarocks on Twitter, or connect with RVA Rocks on Facebook.